It should be obvious from the title that what I consider a wonderful beach read is not what most people call a “beach read.” For me, the beach is a place where hours can be given over to literary immersion for multiple days on end, and I ask myself, why in the world would I squander such precious time on frivolous, dime-store fluff? Beach reads for me are my very favorite types of reads – dark and deep. Here are three of my favorites. Middlesex: Middlesex may have been when I realized that this was my type of beach read. It was years ago, and topping 500 pages, it requires time. If you haven’t read it and you align at all with my bent in literature, please rectify that this summer. Jeffrey Eugenides’ Pulitzer Prize winning Middlesex is a multi-generational saga centered on a Greek-American family. It is about family and secrets and family secrets. There is a bit of what in the South we call the grotesque, but what in Greece was simply a discreet family quirk. Brassy America could not respect the peculiar, and hence we have what some have called the great American novel. Just thinking about it makes me want to add it to my books to re-read list. Perfume: When I joined my book club, Perfume was touted as a standard. A standard for what remains a point of discussion among us, but regardless, I knew I needed to read it. 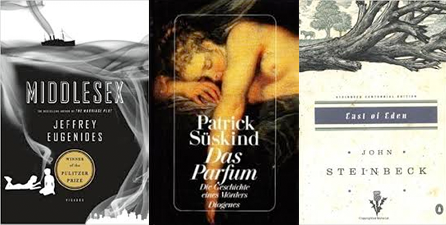 Patrick Suskind’s Perfume is the story of a murderer – that’s actually the subtitle, not a spoiler. The main character, yes – the murderer, has a remarkable sense of smell. Because of this, he becomes a master perfumer. An obsession to possess certain scents that leads him to his subversive career. I wrote a longer review of Perfume that you can find here. Me: Ohhh, this book is so good. Husband: Really? What’s it about? Me: I’m not sure. He’s still setting the scene. When you do finally get to the story, he has incredible characters with artfully woven themes, ageless and universal but so uniquely crafted you’ll feel its the first time literature has truly dived in. There’s Biblical allusions as well as nods to Greek mythology – both favorites of mine. And probably one of the most evil villainess in Cathy/Kate I’ve ever met in literature. With this in mind, I’m looking forward to what I might be reading on this year’s beach trip. Let me know if you have a suggestion.